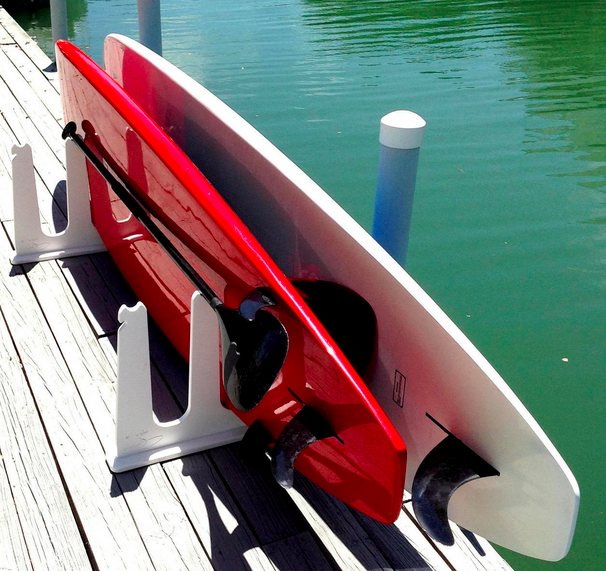 The standup paddleboard rack is a very high-end product designed to safely and securely store yours SUPs on docks and piers. Zero Maintenance: the rack is made from King Starboard, a specialty plastic designed for marine applications. Its construction means these SUP racks can be left out in the sun and salt water for years without fading, warping, or corroding - they are zero maintenance. Freestanding: these racks are freestanding but have the option to be permanently fastened down as well. There are (4) pre-drilled holes in the corner of each rack that allow you to easily bolt down the racks to your dock or pier. Cable Lock Holes: each rack arm incorporates cut-outs for looping cable locks or SUP dock locks through. This feature is especially useful if you permanently bolt your racks down. With your racks permanently installed to your dock and your boards locked to the rack, you have a secure and lockable SUP storage system! Bungee Straps for Stability: for when you don't have your boards locked up, these racks have an integrated bungee cord. This bungee cord secures your SUP down and prevents it from flying away on those gusty days out on the water. Paddle Holders: each rack arm also doubles as a paddle holder. 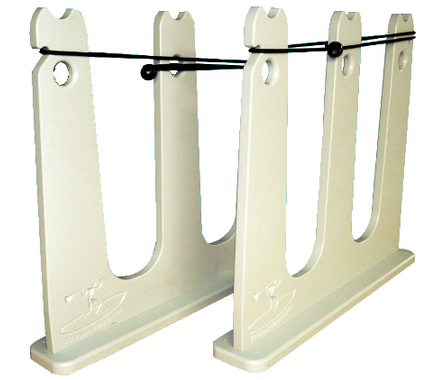 The top of each rack arm has a U-shaped cutout that is perfect for cradling your paddles. Different Size SUPs: this version of the rack is designed for most normal sized SUPs, but if you need something bigger we have a version with wider slots - the Freestanding SUP Rack for Outdoors | Touring and Race Boards. Check out dimensions at the link if you're not sure. Multiple SUPs Storage: we offer this rack in two different colors and three different sizes to meet your SUP storage needs - 1 board, 2 boards, or 3 boards.